High temperatures yesterday did reach the mid 90s in parts of western North Dakota. 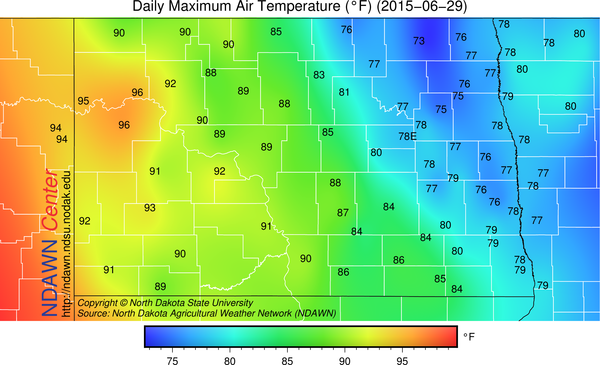 Both Hofflund and Watford City recorded a high of 96° which tied the highest temperature recorded so far in 2015 at any North Dakota Agricultural Weather Network (NDAWN) station. The temperatures in eastern North Dakota were held down because of of a thick overcast of smoke from forest fires in Canada. That “haze” was clearly observed on satellite imagery during the day. From ground level the sun was a faint glowing ball of red most of the day. 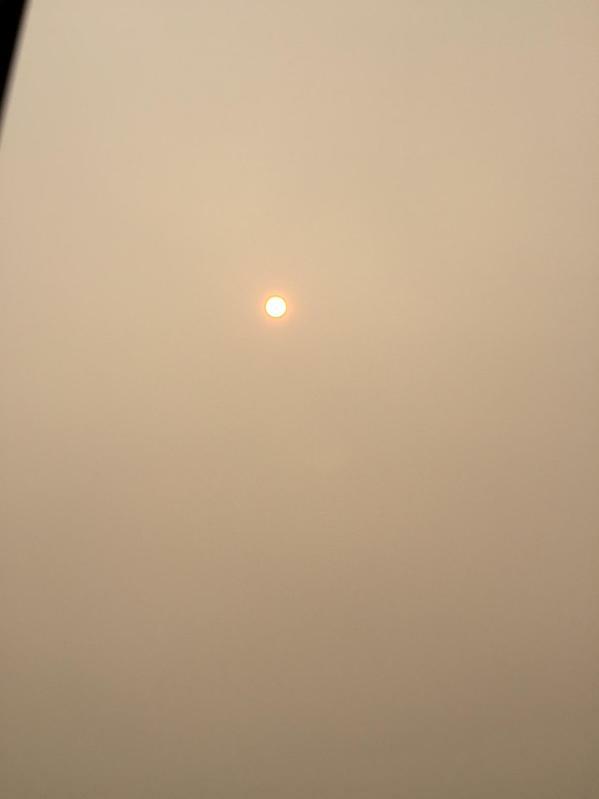 At times the smoke was so thick that the sun was not even visible at times. But the view from the picture below represents the conditions much of the day. What otherwise would have been a day with maximums in the mid to upper 80s, turned into a day with maximums in the mid to upper 70s. This did not go unnoticed on Social Media. Where it was sunny and hot yesterday, it will be cloudy with some scattered thunderstorms and showers. Where there was smoke yesterday, there will be high clouds, plus smoke today, but probably no rain, although eastern North Dakota will likely record at least some hit and miss activity tonight. 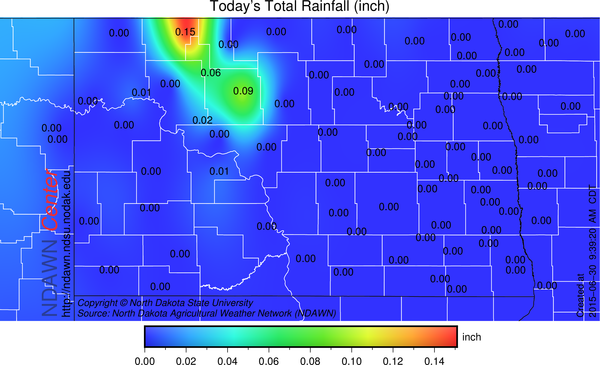 The showers in central and western North Dakota are on-going this morning and there will likely be some activity on radar all day. The High Resolution Rapid Refresh (HRRR) simulation of future radar returns are presented below. Rainfall through 9:30 AM is indicating that the rainfall has so far been generally light and that trend should continue with one-third of an inch or less totals expected for most locations from this storm. The clouds will limit the maximum high temperature potential in western North Dakota from the mid 90s of Monday, to more in the 80° to 85° range. 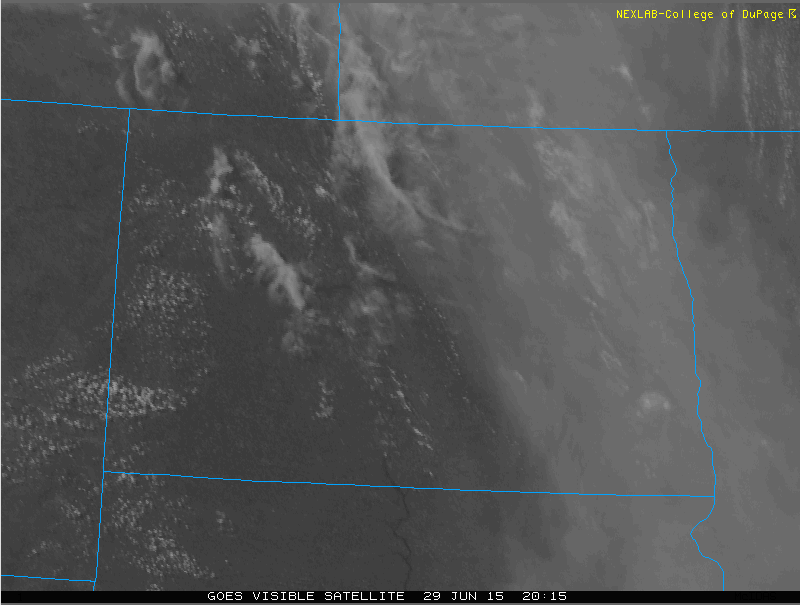 In the eastern part of North Dakota into western Minnesota the maximums will once again be limited by the persistent smoke, plus, some high cloudiness overlaying the smoke. 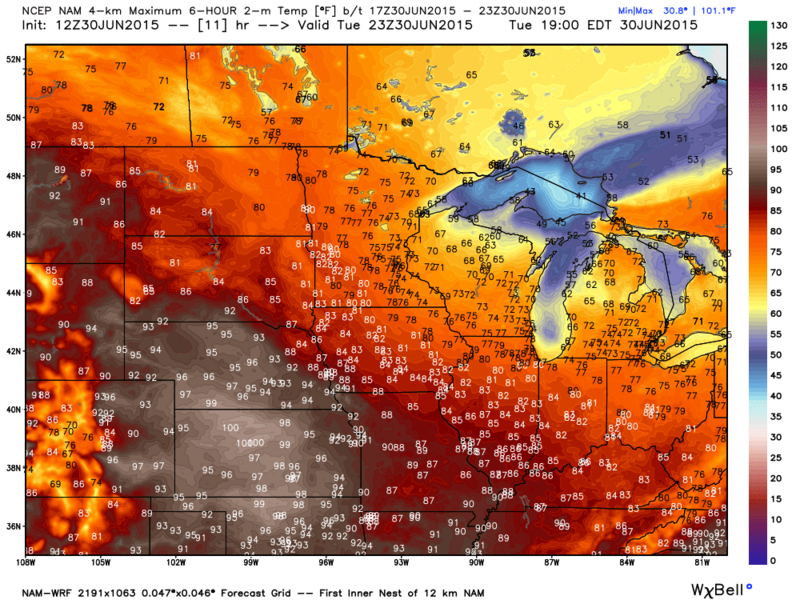 Potential maximums would be in the middle 80s, but without the Sun that seems unlikely at this point. After today and tonight, the next threat of rain looks to be on Thursday and Sunday. The ridge in western North America is still projected to retrograde (move westward) over the next 10 days. Keeping the region in a northwest flow aloft much of the time, yet, on the cooler side of the ridge, being near to below average temperatures after the Independence Day Holiday weekend. An animation of this process of height and anomalies from average is shown in the animation below. A large trough (cool) is expected to develop in response to the ridging shifting west into the northern Pacific. What this means will be a higher liklihood of below average temperatures for the first half of July and as I blogged previously, I feel after a warmer than average June, July will finish slightly below “normal” for temperatures, with a rebound expected for the month of August.